maemo.org - Planet maemo: category "feed:4dc3eb30b1706bbe938a07a9c65b46e8"
FaceBrick was down for about a month earlier due to some unannounced changes to the Facebook API which caused FaceBrick, amongst other Facebook apps, to stop working. During the last few weeks I have been making some final changes to the desktop widget and it should be ready to be merged in with the rest of FaceBrick now. The buttons are slightly different, but not a huge change. * Switched to using the Qt Homescreen adapter. When I was setting the widget to be a homescreen widget manually I noticed that in order to click a listview item or a button, you would have to first click the widget once to get it in focus, then once more for the item you're clicking to actually notice something is going on. This is fixed in a later version of Qt, but using the adapter takes care of fixing this for now - which was my main reason for trying it. It also sorted out some other issues I would have had otherwise, such as making making FaceBrick show up in the "add widget" menu (and re-appear there if removed) and restarting the widget if the desktop were to crash. Using the homescreen adapter is quite easy, you only need an extra 2-3 lines of code and that's it. The only minus with it is that in order to test your homescreen widget, you need to package the application, install it and add it to your desktop via the menu - which probably wouldn't be too bad if you have done packaging before. I ended up having a fun time last week trying to sort out packaging, but I eventually managed to package an example widget with help from this tutorial and the forum. Packaging FaceBrick itself turned out to be more hassle though. FaceBrick uses a third party library called libqfacebook, and MADDE isn't all that happy with third party libraries. In the end I ended up trying scratchbox instead and it worked like a charm (at least for the most part)! I'm using a "Qt Resource Collection" (qrc) file for storing the button images, which is quite handy. This way, the images get stored in the program's executable. That's it for now, but I'll hopefully be back shortly! 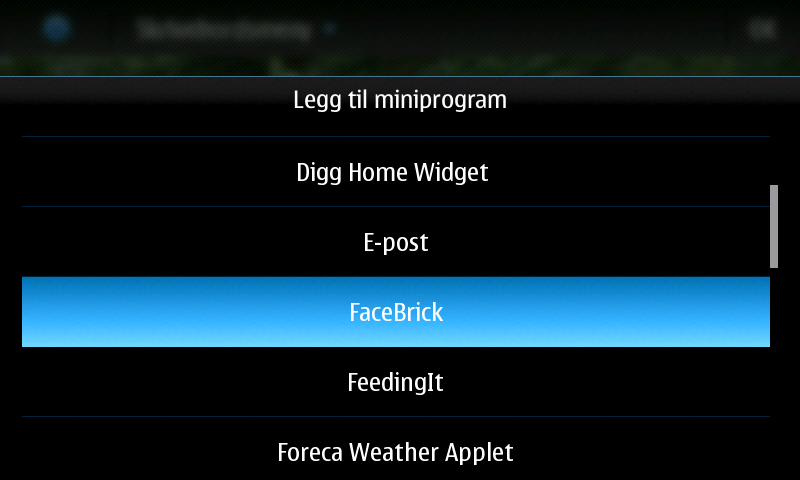 Next up is hooking the widget up with the main facebrick app, so that clicking on a post will open the comment window for the post, and I also have some other bits and pieces to sort out during the next few days. 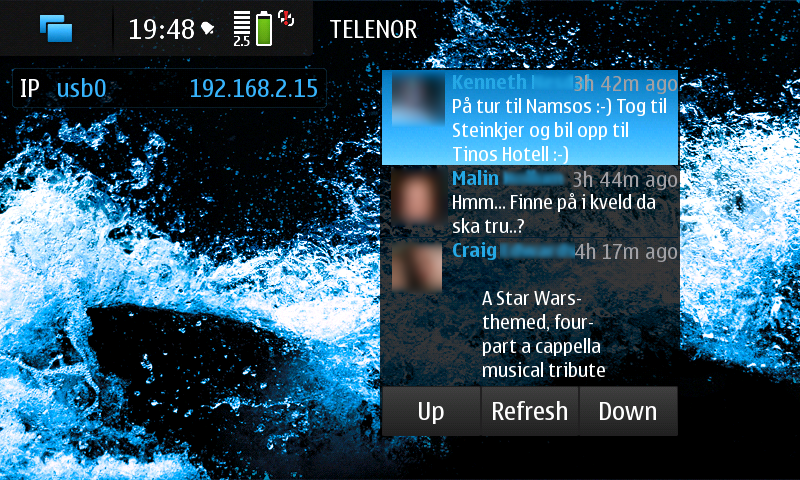 Some further progress on the desktop widget, it now fetches status messages and displays them. 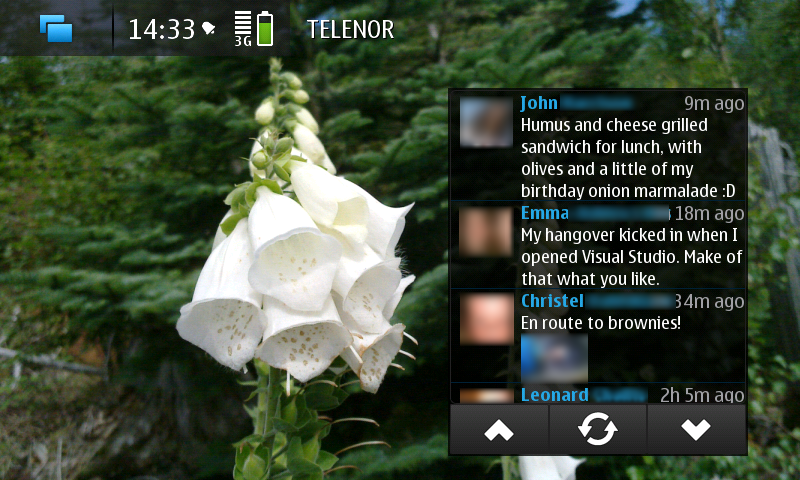 I've had some fun while getting this working, apparently Qt isn't very fond of USB networking, so I kept getting the dialog asking me to connect to a network when running FaceBrick (I'm having to settle with USB networking over here as the router does not like N900s connecting to it ;( ). Setting it to automatically connect to WLAN solved that problem though. I also ran into some problems moving the code for fetching news feed around, as some of the existing code was depending on the news feed methods being a part of the MainWindow. What I'll be doing next is to make the status messages fit into the widget and make it scrollable. I have been trying to make the ListView displaying the status messages transparent, but I haven't had any luck with that so far, so will also be trying to sort that out. 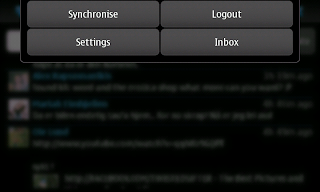 GSOC update - desktop widget! 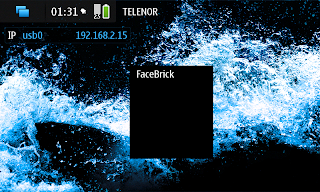 Just a small update on my progress with the desktop/home screen widget for FaceBrick. We are still waiting for Facebook to whitelist FaceBrick so that it will have permission to access facebook messages. This means that the amount of work I'll be able to get done on the inbox is very limited, which is why I have started looking into doing the desktop widget for it instead. After a bit of looking at existing projects and fiddling around with it, I've finally got something resembling a desktop widget. This is of course nowhere near complete, but it's progress! I found this blog post very useful - thanks aep! It has been a while since my last update now, and a lot has happened since then. The first weeks of GSOC went a bit slow due to exams and dissertation - all of which are over now, meaning I've more or less finished my Bachelor's degree (just need to get my results back now :-) ). My task for the first weeks was to implement the use of volume keys for changing font size, this feature was altered in the end. After talking it over with a few people I realised that this might not be the best idea because reallocating keys will only add confusion for the user and isn't all that practical. 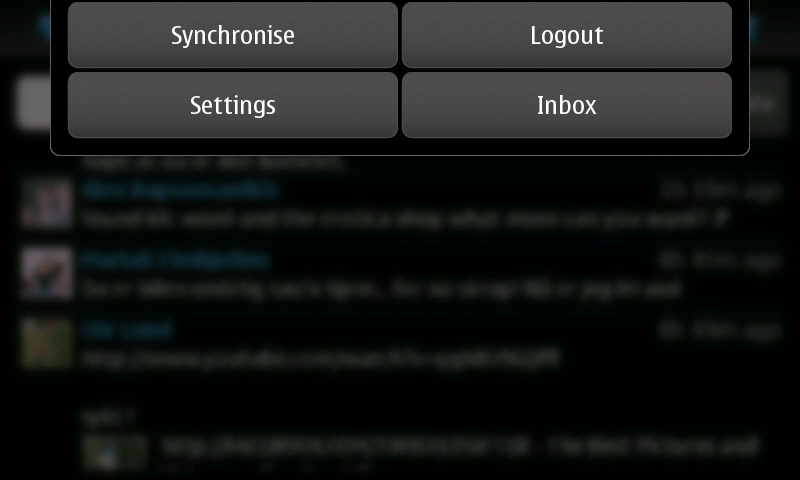 Instead of this, I have added a settings dialog where the user can set the font size. 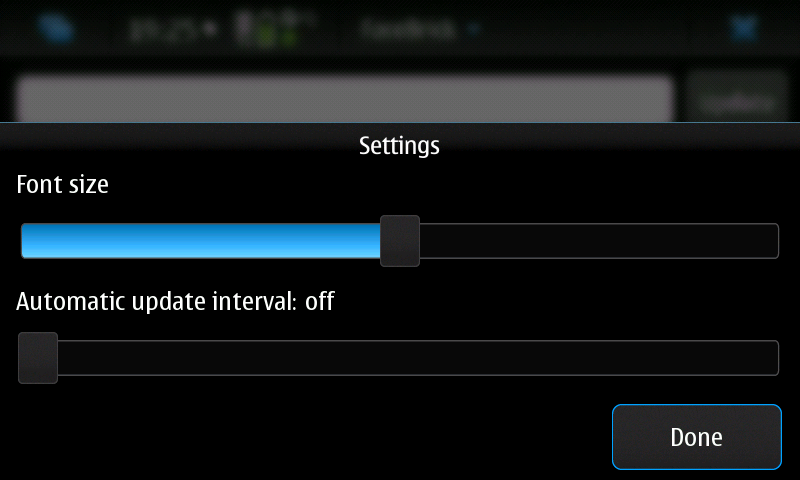 I've also added a setting for changing the automatic update interval. 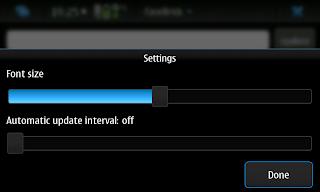 The automatic update interval can be set to 1 - 15 minutes or 'off'. As you can see on the first screenshot, I have also started working on the inbox, but I am now having to wait for Facebook. It turns out that to be able to fetch a user's messages, the application needs to be on Facebook's Inbox API whitelist - which is something I only realised today. Since it might take up to a week for this to go through, I might start working on the desktop widget, unless there's a way for me to get around this for now. 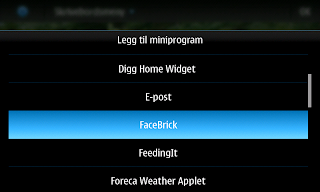 Next I'll be adding a setting to let you disable/enable changing font size via the volume keys, and also a setting to change the update interval of facebrick. Just a small update on my GSOC progress. 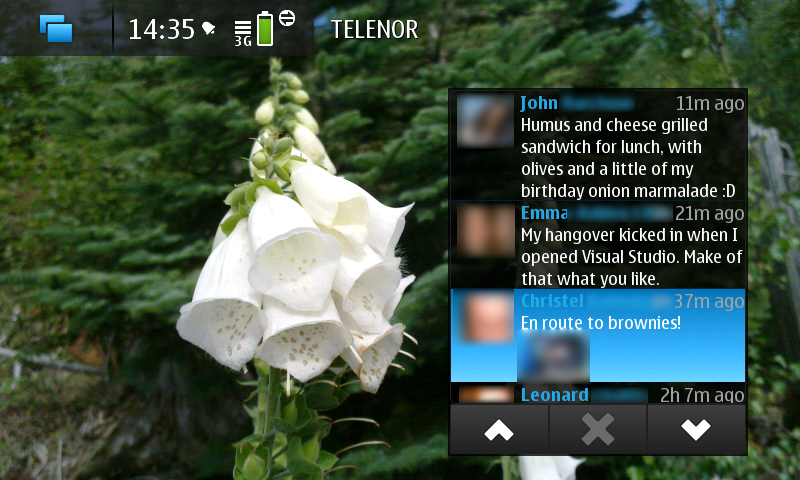 For next week I'll continue working on the volume buttons and integrating it with Facebrick. I have been accepted to GSOC 2010 for Maemo and will be working on FaceBrick - a Facebook client for maemo / the N900 over the summer! The main features I will be implementing are sending and receiving normal facebook messages through the application and a desktop widget which will be linked to the main app. FaceBrick is done in Qt/C++ so I'm looking forward to working with that :-) Will be a nice change to the .NET marathon I've been having at uni! 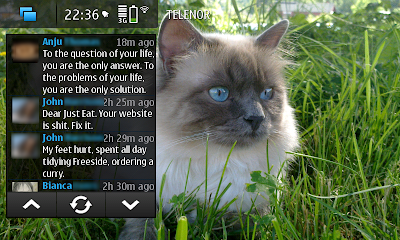 I will be posting regular updates on how this is going as soon as I get started working and http://talk.maemo.org/showthread.php?t=49216& is also somewhere to watch.